The apocalypse may begin with swarming ants. New, deadlier species keep popping up: Researchers at University of Texas recently discovered a new ant species in the Amazon, which they named Martialis Huereka, or "the ant from Mars." It's a predator that feeds on termite larvae. Sure, the wee dude appears benign for the time being, but we're on to him: His evil progenitors have long demonstrated an appetite for destruction, as documented by some of weirdest ant monster movies of all time. EXHIBIT A The Naked Jungle (1954) WHAT TRANSPIRED: An army of ants has designs on taking over a cocoa plantation in South America. (Was the cocoa actually coca?) LESSON LEARNED: The late Charlton Heston, again, proved our handiest weapon against non-human thugs. EXHIBIT B Them! (1954) WHAT TRANSPIRED: Gigantic, irradiated ants terrorize homo sapens in a Darwinian bid for self-preservation. LESSON LEARNED: For the love of god, keep insects away from atomic energy. EXHIBIT C Dr. Who (1965) WHAT TRANSPIRED: While under the power of the Animus, the Zarbi insect species nick the humans' time-travel gizmo. LESSON LEARNED: Giant ants are not necessarily evil, unless themselves subjected to mind-control. 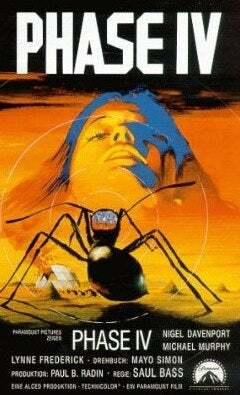 EXHIBIT D Phase IV (1974) WHAT TRANSPIRED: A feral race of ants band together and attack humans in the Arizona desert. LESSON LEARNED: Beware new species. EXHIBIT E Empire of the Ants (1977); also an H.G. Wells short story (1905) WHAT TRANSPIRED: Intelligent ants brainwash folks in Florida, turning them into slaves. (Wells' account takes place in South America.) LESSON LEARNED: Joan Collins is impervious to insect bamboozlery. EXHIBIT F It Happened at Lake Manor (1977) WHAT TRANSPIRED: A placid resort is overrun by poisonous ants high on chemical waste. LESSON LEARNED: Ants notwithstanding, bad things just tend to happen at isolated hotels. EXHIBIT G Legion of Fire: Killer Ants! (1998) WHAT TRANSPIRED: Flesh-eating South American ants coordinate organized assaults. LESSON LEARNED: South America is apparently a hotbed for evil ants. EXHIBIT H MANT (a movie within the 1993 movie Matinee) WHAT TRANSPIRED: "Half man…Half ant…All terror!!'" LESSON LEARNED: Hybrid ants-no less potent.